So you've made the decision to add a brilliant color palette of local, organic produce to your daily diet. We want to ensure you lock in all the nutritional benefits possible! You may be left wondering if it's best to eat raw foods or cooked? Should we peel our vegetables or eat them with skins on? Here are a few guidelines that will help you to make the best decisions you can about how to prepare your precious produce. Tomatoes: Tomatoes are an excellent source of the cancer fighter lycopene. They are also a fantastic source of Vitamin C, an antioxidant that fights cell-damaging free radicals, and folate, a promoter of healthy red blood cells and anti-Alzheimer's aid. While both the vitamin C and folate are preserved best without heat, cooked tomatoes contain three to four time more lycopene than raw ones. The lycopene gets locked in the fibrous portion of vegetables, and cooking releases it. What to do? 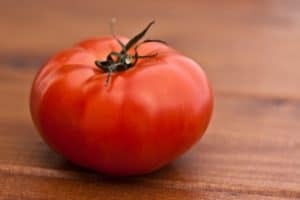 Eat tomatoes in salads to capture the full spectrum of micronutrients, and enjoy them heated in Italian dishes to ensure maximum lycopene delivery. Garlic: We want to make sure that it delivers all of its anti-cancer, heart-protective, fat cell-regulating, and immunity boosting properties. The bad news is that these compounds are destroyed when heated, and garlic can be a bit pungent when eaten raw. The good news is that there is a two-step plan to help you lock in these vital sulfur compounds. 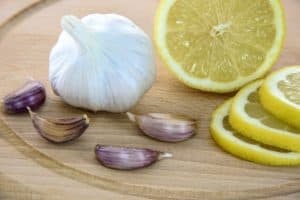 First, chop or crush the garlic at least ten minutes before adding it to heat to stimulate the enzymatic process that converts the phytonutrient aline into allicin, the compound to which many of garlic's health benefits are attributed. Next, only add garlic to a recipe fifteen minutes before it's ready to be served to reduce long-term heat exposure. 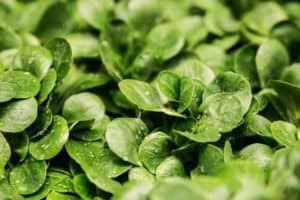 Cruciferous Vegetables: Arugula, book choy, broccoli, brussels sprouts, cabbage, cauliflower, collard greens, kale, radish, rutabaga, turnip, and watercress are all cruciferous vegetables. This family of vegetables contains compounds that can compete with iodine for uptake by the thyroid gland. 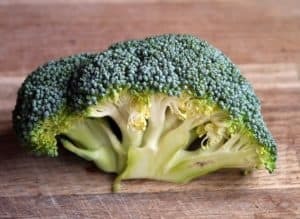 Hence, if you are concerned about slugging thyroid function, you should cook your cruciferous vegetables to reduce these goitrogenic substances about two-thirds. Greens: Enjoy the outstanding micronutrient benefits of leafy greens, but make sure the majority of your consumption is cooked. Spinach, chard, parsley, chives and beet greens all contain an anti-nutrient called oxalic acid. Oxalic acid binds to calcium, magnesium, and iron, robbing you of the micronutrients you expect your food to deliver. Additionally, consuming these foods raw on a regular basis may cause the eventual formation of kidney stones. Research has shown that the boiling of spinach in large amounts of water helps decrease the oxalic acid content by as much as 50 percent. 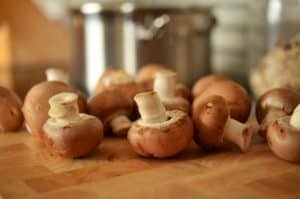 Mushrooms: Cooking your mushrooms rather than eating them raw actually releases the powerful nutrient ergothioneine that helps preserve DNA. However, that isn't the only reason to cook the caps. Agaritine, a potential carcinogen most concentrated in the mushroom caps, decompresses readily upon cooking (up to 90 percent reduction). That makes two great reasons to fire up the fungus. Great news! They made our Fab 14, of the safest produce to buy conventionally! Skin On or Skin Off? While the fruits and vegetables you consume are just loaded with micronutrients and other health-promoting compounds, you may be surprised to know that those varieties with edible skins have tremendous micronutrient content in the skin. This is why we often tell people to put away their peelers. However, if the produce in question is one of the Fab Fourteen, and you opted to save some dough and buy it conventionally, you may be better off using that peeler after all. While the produce may have had limited exposure to pesticides, why take any chances? The rule of thumb here is that if the produce is organic, leave the peel on. If not, peel off. Either way, you want to make sure you wash it well before storing it in your fridge or fruit bowl. Even fruit like citrus and melons needs to be washed well, even though you peel off or cut through the skin or rind. Why? Let’s imagine you are going to cut a honeydew melon. First, consider how many hands have touched it, how many bugs have crawled over it, and how much dust has settled on it along its long journey to your home. Next, imagine the clean knife from your kitchen running through that microscopically filthy rind, cutting through the meat of the melon that you are about to serve to your family and friends. Now, pull the knife back through the same cut, further spreading bacteria. Next, make another cut. You get it now? It is important to thoroughly wash all fruits and vegetables, regardless of type. A diluted vinegar solution followed by rinsing with cold water. A water scrub with a brush. The results showed that the scrub brush with water removed 85 percent of unwanted bacteria (a little more than water alone), but the vinegar rinse removed 98 percent of bacteria on the surface of fresh fruits and vegetables. Interestingly, the study recommended against the use of antibacterial soap because of the ingredient triclosan. This agent, found in many antibacterial soaps, is believed to have the potential to eventually breed drug-resistant bacteria. If you want the most benefit from washing, it looks like water alone isn’t the trick. For more great tips on how to purchase and prepare foods to boost their micronutrient value, check out Rich Food, Poor Food!